The Nature and Environment to Attain and Restore (NEAR) Health Project aims to connect people with blue and green nature spaces. 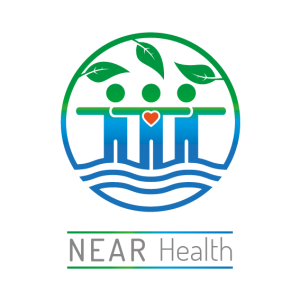 The overall aim of the NEAR-Health project is to design and pilot inclusive nature-based solutions to assist communities value a healthy environment, maintain healthy lifestyles and promote and restore wellbeing. We will utilise perceptions and values to develop a framework that integrates health and environment in Ireland, devise and pilot toolkits to evaluate what communities value in relation to public spaces and to pilot the mechanisms and pathways to mobilise use of blue and green spaces such as parks, coasts and other nature-based solutions to improve people’s health and wellbeing. Recommend implementation strategies in Ireland. Easkey Britton is a big-wave surfer and researcher with NEAR Health at NUI Galway. In this video, Easkey briefly explains her investigations into the mental and physical benefits of blue spaces, and some projects that help people to enjoy the ‘Blue Gym’ effect. Anthony Keane, Director of the Ilen Project, explains how Ilen help communities in Limerick to reconnect with their local river and the sea by reviving the traditional cultural practice of boat building. Ronan Foley tells us about his research and discussions with swimmers around their enjoyment of the ‘Blue Gym’ effect from sea swimming. Mike McClure explains about how his project ‘Be Active, Get Wet’—a European campaign co-funded by the European Commission to encourage more people to get into water sports and recreation—helps people to get involved in water sports and enjoy the ‘Blue Gym’ effect. Clean Coasts Ambassador, Dr Easkey Britton, speaks at An Taisce’s annual Clean Coasts Symposium & Ocean Hero Awards during the ‘Well-being’ session. Her talk, entitled ‘Humans of the Sea’, offers some insights into a new NEAR Health, EPA/HSE study that began in 2016 and which relates strongly to the Sea Change study underway in the EU and USA. Jointly funded by the Environmental Protection Agency and the Health Service Executive. The NEAR Health project is based in the Whitaker and Ryan Institutes at the National University of Ireland (NUI), Galway. Together with the ECO-Health project at University College Dublin, it forms part of the Healthy Ireland initiative.